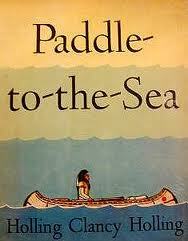 Paddle-to-the-Sea, a 1948 Caldecott Honor Book, written and illustrated by Holling Clancy Holling, traces the travels of a wooden man in a small boat, carved by a little Indian boy, during the winter thaw, down a melting creek in Canada all the way to the Atlantic Ocean. Much can be learned of the geography and culture of the Great Lakes region by following the trail of this small creation. 1. “Excellence of execution in the artistic technique employed.” – Although these illustrations are colorful, they are certainly not my favorite pictures of all of the Caldecott books. Since each object has less-defined edges, these pictures appear somewhat blurry and are confusing for those with visual impairments. 2. “Excellence of pictorial interpretation of story, theme, or concept.” – Since this book encompasses a huge variety of locations and various scenes, each picture is very different from the last and does a good job of telling the continued story. 3. “Appropriateness of style of illustration to the story, theme or concept.” – While the overall watery theme is well-depicted, I felt that the sub-themes such as the Indian culture, manufacturing locations, lumberjacking practices, and fishing as a profession could have been more clearly illustrated. 4. “Delineation of plot, theme, characters, setting, mood or information through the pictures.” – I liked how Paddle took shape as a distinct character at the beginning of the book. The theme and ever-changing setting fit the storyline well, but the mood was unclear. 5. “Excellence of presentation in recognition of a child audience.” – As with some other books, I would suggest spreading out the reading of this one over several sittings, especially with younger children. While we enjoyed the book, it did get tedious and was more difficult to understand for my 5-year old. I believe this book may be more enjoyable for a slightly older child. Many of the illustrations required extensive explanation, but of course, that was great for teaching purposes.